One day your students could be tracking a herd of wild elephants through the bush, guided by an expert wildlife ranger. The next, they might find themselves nursing an orphaned rhino calf back to health or learning about the impacts of climate change on Africa’s threatened ecosystems. For over a decade, our inspirational field trips have challenged students to see beyond the purely academic side of wildlife conservation and experience for themselves the physical, social, ethical and emotional challenges that this fascinating world presents. All while surrounded by Africa’s awe-inspiring natural ecosystems. By combining education with real conservation work, our goal is to empower students with the greatest lesson of all – the belief that they can have a lasting positive impact on the world. All our field trips are planned bespoke to meet the needs of you and your students. To talk about the expedition you’d like us to create for you, just get in touch. We love sharing ideas. From creating a unique expedition based on your learning goals to delivering 24/7 support, we understand the needs of students, parents and educators. Your students will experience life in the real African bush, learning from conservation experts while developing leadership and teamworking skills. By teaming up with real conservation projects and initiatives, your group will make a lasting difference in the fight to save Africa’s wildlife. We believe the very best educational field trips inspire students to ask questions – of others, of themselves, and of the world around them. This is exactly what our school field trips in Africa are designed to accomplish. 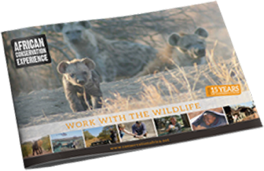 We’ll immerse your students in the world of wildlife conservation. They’ll work with some of the most inspirational species in the world, including elephants, rhino and lions. They’ll witness these creatures in their natural habitats. And they’ll learn from some of the most highly skilled and experienced conservation professionals in southern Africa. This is an environment that really highlights the relationships between people and nature. In fact, you could argue southern Africa illustrates humankind’s impact on the natural world at its most positive and most negative. It is also culture where people don’t have the financial or social security that many Western nations take for granted. This beautiful, dramatic and often complex world will create the backdrop for your educational field trip in Africa. Whether you choose to focus on these issues or others, they are certain to focus the minds of your students and challenge them to question their worldview. Another educational benefit of our field trips is that working with animals is a great leveller. Perhaps the student who always gets the best grades in class finds that applying their knowledge in a practical scenario isn’t so easy. Maybe a student who doesn’t excel academically is a natural when it comes to dealing sensitively with animals. From a conservation point of view, one of the most important outcomes of our school field trips isn’t what your students take away – it’s what they leave behind. Namely, a legacy of support for southern Africa’s wildlife conservation projects; worthwhile initiatives that are leading the battle to secure the future of Africa’s natural wonders for future generations.